Prime Minister, Shri Narendra Modi, today inaugurated India's longest bridge - the 9.15 km long Dhola-Sadiya bridge, over the River Brahmaputra, in Assam. This was his first engagement on the third anniversary of his swearing-in as Prime Minister. The bridge will enhance connectivity and greatly reduce travel time between Assam and Arunachal Pradesh. After unveiling a plaque to mark the inauguration, the Prime Minister travelled, and walked on the bridge for a few minutes. 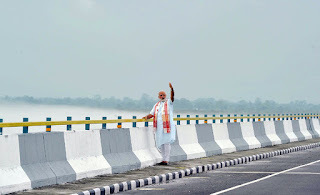 Later, addressing a public meeting at Dhola, the Prime Minister said that the inauguration of the bridge marks the end of a long wait for the people of this area. Dhola-Sadiya bridge is India's Largest Bridge (9.15 Km) over Brahmaputra River. It will enhances connectivity between Assam and Arunachal Pradesh, and opens the door for economic development, on a big scale. Construction of Bridge began in 2011 during the tenure of the Manmohan Singh led UPA government, under the aegis of the Ministry of Road Transport and Highways in public private partnership (PPP) with Navayuga Engineering Company Limited. The bridge was scheduled to become operational from December 2015, but finish of construction works was delayed. The project cost around 10.00 billion rupees and will take around 4.5 years to complete. It is 3.55 kilometres (2.21 mi) longer than the Bandra Worli Sea Link in Mumbai, making it the longest bridge in India. The bridge inaugurated on 26th May 2017 by Hon'ble Prime Minister of India Shri Narendra Modi.